Moncton from the sky: a sea of asphalt! This is the continuation of the planning for Saturday July 28, when we arrive in Moncton, New Brunswick, Canada, in the middle of the day, by train. This got a bit fiddly. We had hoped to keep our car rental to a minimum by spending the afternoon in Moncton and picking the car up from Moncton airport as late as practical in the evening. Incidentally, the reason we need to get a car at the airport is that we want to return it in a different location and it seems only the airport rental shops will allow us to do that. That doesn't matter, because we really need to spend the afternoon doing laundry and grocery shopping. (NOTE TO SELF: Eventually, make a list of meals that will be self-catered/picnics in order to plan the shopping). In my quaint European way, I imagined everything I needed would be within a reasonable walking distance, close to the centre of a walkable city! 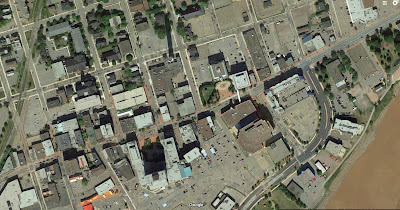 Then I saw Moncton from the sky. It's an ocean of car parks, with occasional buildings rising from the surface like little islands. I had heard about such things, but I have never really experienced them. I guess my USA experiences have been pretty selective. At any rate this is an overhead view that broadcasts to the world that pedestrianism is odd and motorised vehicules are expected. Also, the launderette and grocery stores are miles from the station and the public transport to the airport is timed to coincide with the arrival of the trains. 14.00 - Pick up the rental car. NOTE TO SELF: Modify the rental car reservation. Hit the launderette (it closes at 18.00), the grocery store (closes late) and check-in at the hotel from 15.00. The hotel looks pleasant, with its own little walking trail through the woods, so make some time to relax and go for a stroll. There is no restaurant at the hotel, but there are a couple of them a short drive away, or we can go into town. Restaurants mostly close by 22.00. We should probably try the recommended Bistro 33, as it is close to the hotel, and will be closed on Sunday. NOTE TO SELF: The final thing I need to do around the car rental is verify our insurance situation and make sure to get a print out of the conditions. Apparently, in Canada, they are more likely to ask to see this. There is a question in our minds whether both of us are insured or only Mike, and that may impact the decision of whether to add me as a second driver. In the next few days, I'll be planning the road trip across eastern Canada. I'm trying to make it comfortable for a single driver, but... there are quite long distances to cover. Oh yes, and that reminds me: I also need to check the mileage on the car rental reservation. I haven't the time or energy to mess with car rental reservations today. In any case, I think I'll just finish planning the road trip so that I can see exactly what we need.